All the wine lovers and foodies had ever been to Jerez de la Frontera! To explore this place you’ll definitely need car rental Jerez de la Frontera. We offer car rental services in this case: we compare car rental companies all over the world in 30,000 car hire locations and then provide you with the most affordable deals among them! All you need is to complete our car rental form. And then you’ll get a reliable rental car at cheap price in Jerez De La Frontera Sherry Park or Jerez Downtown (see full list below). 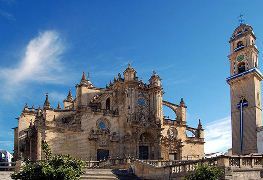 With car rental in Jerez de la Frontera can visit Alcazar (fortress), a mosque, St. Salvador, St. Miguel Church, San Mateo, San Juan, as well as Laguna de Medina, La Suara and Montes de-Propio parks. Visit numerous museums: Archaeological, "Sherry Riddle", a museum of wine, bullfighting museum. You can visit genuine Arab Baths, which are in the old part of the city. RentalCars24h.com offers you reliable car rental Jerez de la Frontera services that will help you to feel free and independent when moving around the town. Providing best online prices for car hire Jerez de la Frontera services, RentalCars24h.com allows you to save money each time when you rent a car in Jerez de la Frontera.